Product Description Reclaimed Inspiration. 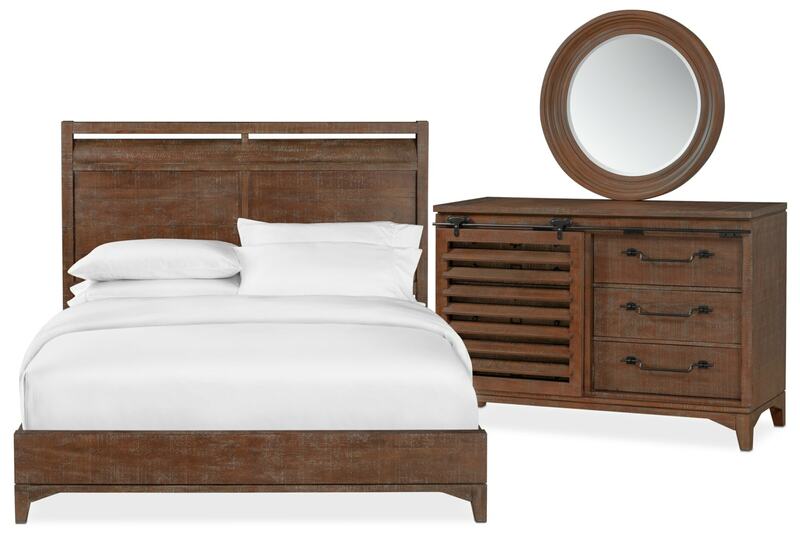 Retreat to your own countryside abode with the impeccable Gristmill bedroom set. Whether you love a coastal-, industrial- or loft-inspired environment, this ensemble beautifully blends with nearly any décor. An immaculate, cocoa raised grain finish draws inspiration from salvaged wood, showcasing the innate character each piece holds. The highlight of this set is the platform bed that perfectly balances soft curves with sleek lines. The antiqued, rolling shutter door found on the dresser is inspired by a traditional farmhouse aesthetic, while the powder-coated, custom-crafted hardware further amplifies the industrial appeal. Customer assembly required. Unique Features: Spacious drawers are adorned with sleek bar handles.